No matter WHO you root for, from the Denver Broncos to the Seattle Seahawks to Tight Ends or the Commercials.... this is a once-a-year event! SUPER BOWL 2014!! So JOIN ME in Toasting these two awesome teams, who with hard work, made it to the Super Bowl! Create a hand-stamped, fringed, die-cut card to celebrate this momentous event!! Fringe Scissors (#133325) NEW from the Occasions Mini! Cutting the Whisper White card stock as the card base allows me to tie in the team colors (which both have White as one o their colors). Cutting the card stocks on each side at 2" x 4-1/4" and 1-1/2" x 4-1/4". Using the Stampin' Trimmer and Score each side at the 1/2" mark. This allows me to have a guide on where NOT to cut with the Fringe Scissors and also a secure place to adhere the ends down with SNAIL adhesive. Using the Fringe Scissors cut these cute celebratory fringes to mimic pom poms or cheering in the stands. Layer them so that the team colors face one another. Using the Typeset Alphabet Dies and Silver Glimmer paper to create the numbers. 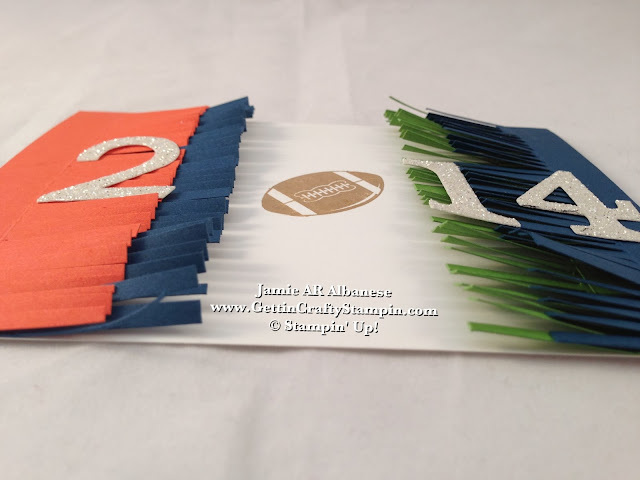 Stamping the football from the Great Sport stamp set with Baked Brown Sugar ink in the center for the '0' you create a fun Super Bowl themed year! Using the Glue Dots to adhere the numbers to the fringe. Create a quick and fun card to celebrate this big day... and share it with those who love the game! No matter WHO you root for... these teams have worked hard to raise above the rest! Leave me a comment for who YOU root for and I will pick a winner to receive a collection of cards inspired by that team!! So toast this fun day to gather, eat junk foods and root on the teams, commercials while enjoying the tight-ends and Half Time Show (lol)! 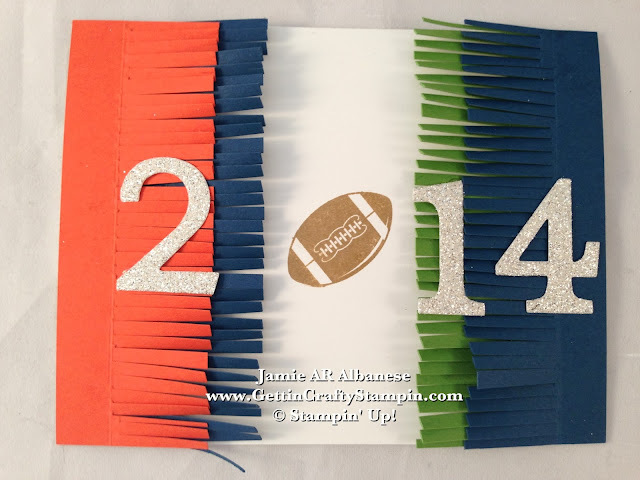 This quick and fun fringe, die-cut, hand-stamped card toasts Super Bowl 2014! !